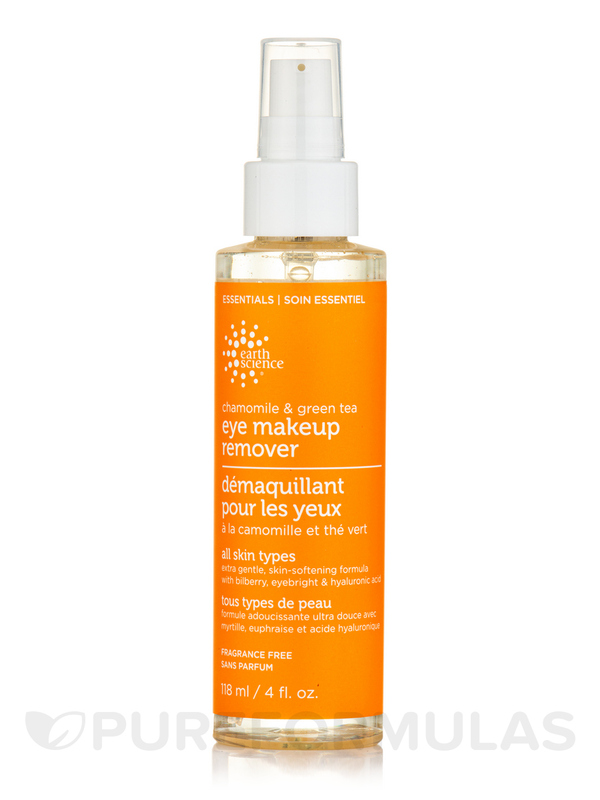 I love Chamomile & Green Tea Eye Make-up Remover by Earth Science. It takes off my eye makeup with a breeze. 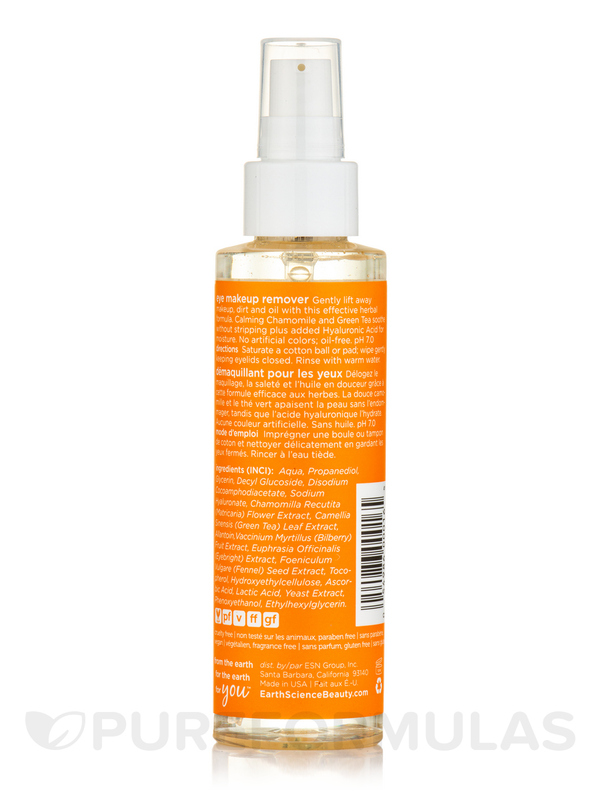 Chamomile & Green Tea Eye Make-up Remover by Earth Science is very gentle, but really removes make-up! I will order again! I have been using Chamomile & Green Tea Eye Make-up Remover by Earth Science for many years and it's always worked well. It's easy to use and it removes all eye make-up thoroughly. Gentle‚ effective and fragrance free. Great for removing mascara! A gentle and effective herbal formula to purify and refresh the skin while removing makeup. Non-irritating; no artificial colors; 100% fragrance free. Unscented. Aqua (Water)‚ Disodium Cocoamphodiacetate‚ Decyl Glucoside‚ Glycerin‚ Sodium Hyaluronate‚ Hydroxyethylcellulose‚ Tocopherol‚ Allantoin‚ Vaccinium Myrtillus (Bilberry) Extract‚ Beta Glucan‚ Chamomilla Recutita (Matricaria) Flower Extract‚ Euphrasia Officinalis (Eyebright) Extract‚ Foeniculum Vulgare (Fennel) Fruit Extract‚ Camellia Sinensis (Green Tea) Extract‚ Camellia Oleifera (Green Tea) Leaf Extract‚ Saccharomyces Cerevisiae Extract‚ Ascorbic Acid‚ Lactic Acid‚ Sodium Hydroxymethylglycinate‚ Phenoxyethanol. No Artificial colors; 100% Fragrance-Free. Unfortunately Chamomile & Green Tea Eye Make-up Remover by Earth Science does not work on water proof mascara. Does not work on water proof mascara. Chamomile & Green Tea Eye Make-up Remover by Earth Science is effective and non burning. I can open my eyes after rubbing this makeup remover in over my eyes without any irritation. The most effective non oil based remover. Cruelty-Free. It has good ingredients and it removes eye make-up easily and completly. 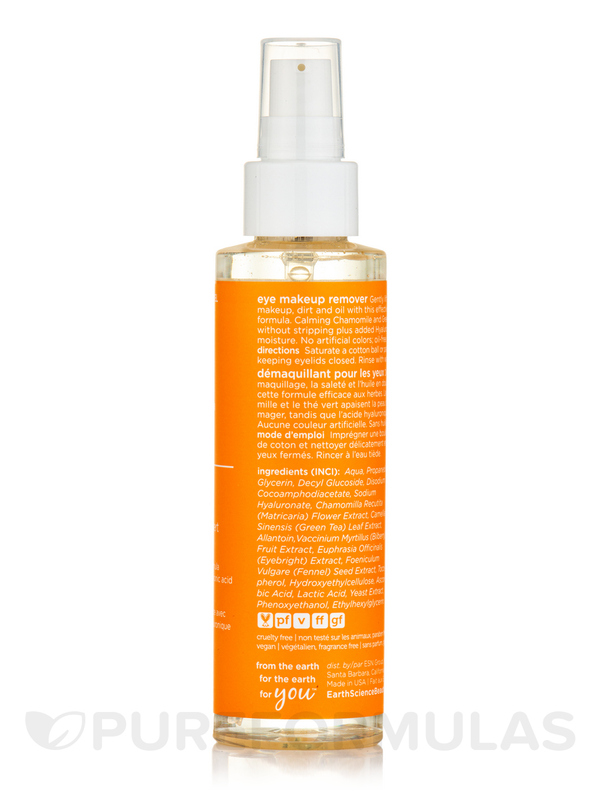 Chamomile & Green Tea Eye Make-up Remover by Earth Science is great for sensitive skin. The first time I used Chamomile & Green Tea Eye Make-up Remover by Earth Science, my eye makeup completely came off. Some people said it doesn't work for them, I suggest you wet your eyes, rub it in like you would do as if you are cleaning your face, then rinse it off. The problem is the day after my eyes kept itching and became really dry, with flakes. I don't know if it's from this or cold weather. I started using Chamomile & Green Tea Eye Make Up Remover by Eath Science a few years ago after trying many conventional makeup removers. Many of them either burned my eyes or left oily/chemical type residues. This makeup remover didn't have any of the same qualities (chemical scent, coloring etc) that I was skeptical it would even work. Let me assure you, it works wonders! It's odorless, comes out as a clear gel, and leaves no residue! It doesn't hurt my eyes, it washes off clean, and it is extremely effective. I don't wear much cover up, but my eye make up very thick and dark. This washes it right off. Natural, no strong scents, clear gel like, washes off clean with no residue, effective! Nothing! The price is right, and it actually lasts quite awhile. Love this stuff! Works great!! I used to use make-up remover pads, but they started to make my eyes burn. Chamomile & Green Tea Eye Make-up Remover by Earth Science is so gentle, but takes off all make-up with ease, even waterproof mascara!! No burning either!! Love it! Doesn't burn at all, gentle.